The annexation of Crimea was the smoothest invasion of modern times. It was over before the outside world realised it had even started. And until Tuesday 18 March, when a group of pro-Russian gunmen attacked a small Ukrainian army base in Simferopol, killing one officer and injuring another, it was entirely bloodless. For much of February, thousands of extra soldiers were quietly sent in to the bases which Russia was permitted by treaty to own in Crimea. Civilian "volunteers" moved in too. The plan was carried out secretly and with complete success. The first obvious sign that Crimea was being taken over was on Friday 28 February, when checkpoints were established at Armyansk and Chongar - the two main road crossings from mainland Ukraine to the Crimean peninsula. These cut-off points were controlled by men wearing a variety of uniforms: Ukrainian army, Ukrainian police, as well as camouflage without national insignia. Several wore civilian clothes. When I tried to get through the Armyansk checkpoint on Saturday 1 March, together with a BBC cameraman, these men were hostile and threatening. They stole the bags containing our body armour from the boot of our taxi, and went through our suitcases aggressively, pulling out the things inside and dropping some of them on the road. They took our camera away and filched the expensive electronic recording cards from it, together with the camera battery. They knew exactly what they were looking for. There were more bags containing body armour piled up at the side of the road, where other journalists had tried to get through before us. The men at the checkpoint were stopping everyone except local people from passing through. I found it hard to work out what was going on. It was only when one of them, wearing a police uniform, called out "Welcome to Russia!" that I understood - their uniforms might be Ukrainian, but they were sealing off Crimea on behalf of Moscow. By the next day, Sunday 2 March, it was all over. 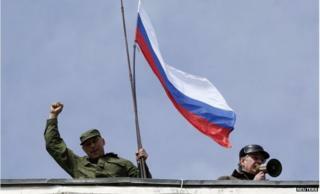 The outside world was still expecting Russian ships to arrive and capture Crimea. But it had already happened by stealth. On Sunday and Monday the Ukrainian military bases were taken over by tough-looking soldiers. They carried the latest Russian military weapons, but their uniforms had neither national or unit markings, nor badges of rank. Alongside them were the "volunteers" - usually older men, many of whom had apparently come in from Russia itself. Some wore bits and pieces of uniform, others plain clothes. They lined up outside the Ukrainian bases and prevented anyone getting too close. Presumably they were Russian reservists. They were tough and aggressive, but they obeyed the orders of their superiors. Many were obviously heavy drinkers, and at night a few were openly drunk. Yet their discipline held. There was no looting, and although their behaviour was threatening they did not attack civilians. In the days that followed, other groups appeared. These were genuine volunteers, who had come from Moscow to join what they saw as the liberation of Crimea. I spoke to three members of an ultra-nationalist group whose uniforms bore the colours of an extreme royalist organisation. They were all from Moscow, and they all planned to move on from Crimea to the mainly Russian-speaking cities of Kharkiv and Donetsk. Why? To show solidarity, they said. Later I came across a group of seven or eight bikers wearing leathers with badges of rank on them - president, vice-president and so on. They had also come down from Moscow, and were planning to head off to Kharkiv and Donetsk. "It's a great day," the "president" said. But these were Johnny-come-latelys - amateurs who just wanted to join the fun. There was absolutely no sign the Russian government had sent them. According to a well-known opponent of Mr Putin's, the vote in Crimea to join the Russian Federation was "a referendum under the Kalashnikov". But it wasn't. The outcome was what the vast majority of Russian-speakers in Crimea really wanted, and there was little need for Kalashnikovs in the streets. Those who wanted to keep Crimea a part of Ukraine were far too shocked and intimidated to resist. The entire operation was very cleverly planned and carried out. But there is absolutely no doubt what it was - a remarkable, quick and mostly bloodless coup d'etat.